A top down view of both the shoe and the lid. The lid fits in the shoe with a short flange. The pin-pointed pattern on the top of the lid does not pierce all the way through, probably added for decorative purposes only. Two handles or lugs are found on the top of the lid. 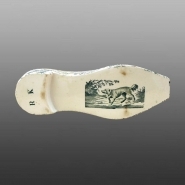 One of the ususual aspects of this piece is the animal or sporting pattern printed on the sole of the shoe providing notable constrast with the chintz-floral design printed on the shoe and lid. The initials "R K", also printed in green, suggest that this was a made-for-order item. An earthenware shoe shaped container with lid printed in green in an all-over floral pattern with a decorative floral button printed on the toe. A simple linear floral border is printed around the shoe and lid. Although it is large, it may have been used as a snuff box. Wooden snuff boxes in this size in the shape of a shoe were more common. See other views of this piece.